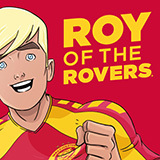 We are absolutely delighted to announce that the official home kit of the mighty Melchester Rovers, as seen in the pages of the 2018 Roy of the Rovers reboot, is out now! That's right, just in time for Christmas, we've teamed up with Hummel to bring the brand new Rovers home shirt to life. The first Melchester Rovers kit of the modern era is (in our humble opinion) a classic. Designed by Hummel in the iconic Rovers red and yellow, this is a shirt every Melchester fan - and every aspiring Roy Race - can be proud to wear. The 2018/19 home shirt is available in adult and children's sizes, but numbers are very limited - so make sure you head over to the store and grab yours now! Head to the Roy of the Rovers shop and get your Official Melchester Rovers Home Kit 2018/19!